Bev's Country Cottage Blog: It's still me! As you might have noticed, I have changed the look of my blog, updated and added some new features. This past Monday, I had such a lovely surprise, a wonderful HUGE box came in the mail! 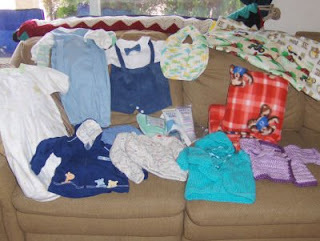 The gals on my yahoo group 'Bev's Charity Challenge' had held a 'grandma-baby shower' for me and for my new grandbaby!! Can you believe it! I have to share a photo of the items that were sent. I am still in awe! Are all those items just darling or what!? I can't wait to hold him and then, yes, change his clothes and dress him all cute! This granny thing is just too exciting. I have been working on some new patterns to share with all of you, and I will do that this coming week as I am only working a couple of days and will have more time to do that. 2 are for baby bibs, because LDS Humanitarian needs those right now, and 1 is for a ribby dishcloth. Who can't use more dishcloths or washcloths? I need to get off here and get supper started so we can eat tonight. And I will get photos of those bibs and dishcloth and get them posted ASAP.